Permanent Change of Station. Lisa Stice. Johnstown IA: Middlewest Press, 2018. Lisa Stice, poet and military spouse, draws from real-life experience in her new book that is searing with the invisible suffering that a modern military family endures. 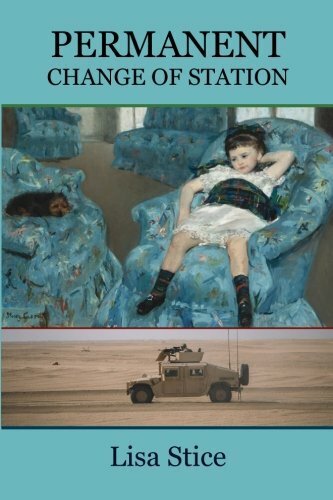 Stice’s second collection of poetry, Permanent Change of Station depicts a military deployment from the vantage point of the home front. Unapologetic in its humor and pain, Stice’s work investigates the void left by a loved one when they are away. The title, though usually reserved for a soldier’s relocation to different military base, elevates the collection. Drawing on the notion that nothing is permanent, Stice questions the very use of the word permanent in the opening poem, “PCS.” Though calm and steady in its pacing, Stice’s poems open up to a much larger and deep-seated revelation—that it is not the duty station that is permanent, but the state of mind that a military family must resolve themselves to in order to withstand and survive the rest of their soldier’s career. In the mundane rootlessness of it all, Stice seems to define what a marriage and a family must become to survive while the soldier is away, the family living in slow motion in the hopes the soldier will not miss too much at home. But as the book progresses, we see the daughter growing up before her mother’s eyes. In section titled “The In-Between,” the poem “Learning to Speak” drives home the reality that time does not stop; the line “Dada gone” repeated over again in each stanza, implies in its simplicity that the daughter’s first words and the absence of her father are the truth of her upbringing. Stice’s style of writing, which is quite accessible, seems to draw at the same conclusion every time: war is hell for everyone. And while Stice’s simplistic style is relatable to the everyday reader, the overall theme does at times become slightly overused throughout the book. For instance, in the second section of the book, the poem “Fix, Mommy” discusses the toll of the spouse, “Some things just never / go back to the way they were,” and then, in the section titled “Bedtime Stories,” in the poem “Blue Girl,” we see again the strain Stice endures while watching her daughter color with crayons: “daily struggles and sacrifices unnoticed / drawn out in crayon on white paper.” However, though there is repetitiveness in the thematic structure, the way in which Stice approaches the topic of spousal difficulties is unique and refreshing every time, allowing the reader to peel back the drywall and stucco and enter a world that thrashes with uncertainty and, at times, regret. The only thing that seems permanent is the uncertainty of what will be sacrificed next to keep the illusion that nothing has changed in the time away. Brooke N. King served in the U.S. Army, deploying to Iraq in 2006. Her work has been published in The Atlantic, War, Literature, & Arts; and Prairie Schooner, to name a few. King’s memoir, War Flower: My Life after Iraq, is forthcoming in March 2019 from University of Nebraska Press. Older PostHave You Read This? #Reviewing "Good kill"